€5,000 would go a long way for any GAA club. 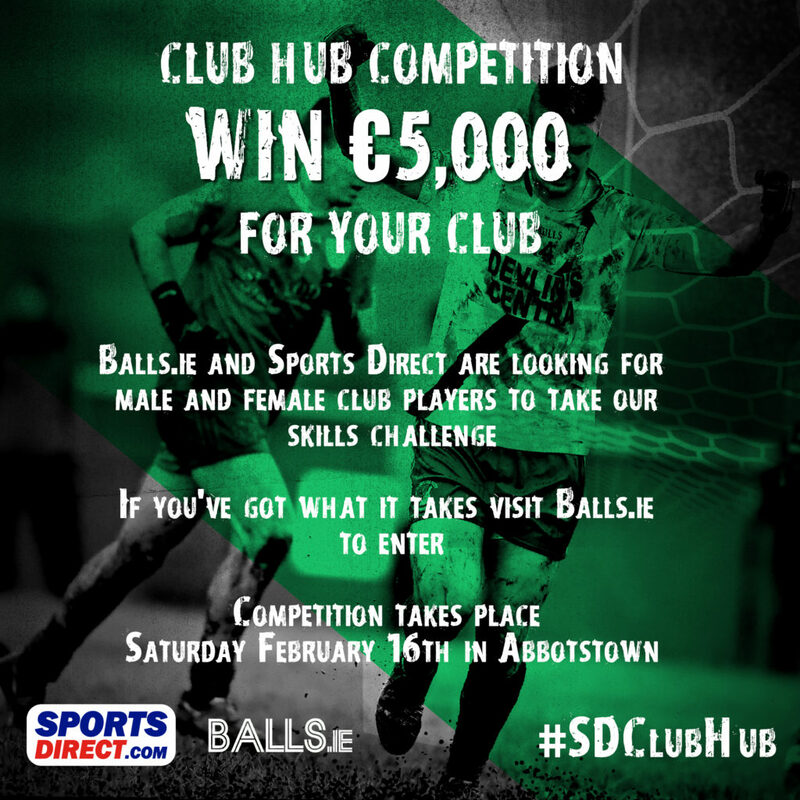 Well, Sports Direct and Balls.ie are delighted to announce an exciting competition where one male and one female club GAA player can win €5,000 for their club if they come out on top in our gruelling Club Hub Competition. We are looking for 20 male players and 20 female players looking to take on GAA skills challenge. This will be held on February 16th in Dublin and see players testing the strength, speed and stamina. It doesn't matter if you come from the biggest club in Dublin or the smallest club in Leitrim, if you play gaelic games, we want to hear from you and have you enter our Club Hub Competition. Email [email protected] or fill out the entry form below telling us who you are, what club you come from, why you deserve to be shortlisted for our Club Hub Competition and why €5,000 will make a difference for your club. Note this is not just a competition for men and we want to hear from ladies GAA players as well. Special consideration will be given to players who send us videos or photos showing off their GAA skills - all players who submit videos will be eligible to win a Sports Direct gift card. The competition is open to all gaelic games players except those who have played Championship intercounty hurling, football or camogie. Winners will be chosen by Balls Media, from all valid entries received, and verified by the Promoter and its agents. The Finalists will be contacted from the Balls Media team on February 6th. If the Finalist cannot be contacted or does not provide confirmation as set out above, the Promoter reserves the right in its sole discretion to decide whether to select a replacement winner or not. The decision made by the Promoter as to those able to take part and selection of Winners is final. No alternative to the Prize is available. Employees and agents of Balls Media and Sportsdirect.com Retail Limited and its Group companies are not eligible to participate in this Competition, nor are their relatives or members of their families or households. The Promoter may cancel the Competition by giving notice on this webpage. The Promoter accepts no liability for cancellation of the Competition. No cash or alternative Prize or compensation will be offered in the case of cancellation of the Competition. This Competition is in no way sponsored, endorsed or administered by, or associated with, Facebook, Twitter or Instagram. You are providing your information to the Promoter. By participating in this promotion you agree to a complete release of Facebook, Twitter or Instagram from any claims in connection with this Competition.